Save the date, register early and check back! 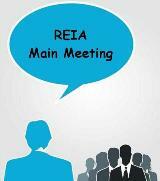 with details about the REIA Main Meeting soon! Learn from the best at "pitch free" REIA meetings and classes and enjoy networking that is second to none with "like minded" real estate investors. Connect with the many REIA Business Members on hand to build or grow your real estate investing team!